Kyle Lombard points out the exit hole from a tetrastichus wasp. Last week, a UPS truck rolled up to an office of the Division of Forests and Lands. Its cargo? A cooler full of Asian wasps from a lab in Michigan. Molly Heuss, who works on the state’s emerald ash borer program, cuts off the packing tape that holds the cooler shut to check out its contents. “It says we’ve got 6,850 female Tetrastichus planipennisi,” she says. New Hampshire is home to roughly 25 million ash trees. Two years ago, we learned the state is also home to a devastating invasive beetle – the emerald ash borer – which can completely destroy infested stands of ash trees in as little as six years. Now state foresters are hoping that bringing the pest’s natural enemies over from Asia can save the Granite State’s ash trees. These aren’t the wasps that build nests under your eaves and need to be sprayed from 60 feet away. There are three species that have been approved for release in the US. The largest around the size of a mosquito and the species being released in New Hampshire this year are about the size of a black fly. None of them actually have a stinger, and are called wasps simply because of the shape of their body. “They do not sting people, They’re not interested in any of our native insects. They’re not interested in anyone’s puppies or cute animals,” says Huess. After emerald ash borer was discovered in Michigan in 2002 and began to decimate the Midwest’s ash trees, foresters started looking for ways to fight back. They looked to its native range, where they don’t kill anywhere near as many ash trees, because in Asia, the beetle evolved with predators. Researchers have found the two species being released here in New Hampshire successfully kill up to 50 or 60 percent of the emerald ash borer. Another species, which has had trouble surviving in the US, parasitizes 90 percent of ash borer in its native range. In American test sites, the parasitoids haven’t achieved anywhere near that rate. Juli Gould, a researcher with the US Animal and Plant Health Inspection Service (APHIS), has found that combined the imported parasites are able to kill around 40 percent of larval ash borer. But as the populations continue to grow, that rate could rise. Heuss and her crew tromp through a little patch of infested ash trees near a dog-park in Concord. For the last two years the state has released two types of parasitic wasps here and in a few other sites around the state trying to get a population established. The wasps in her cooler arrive as larva buried in little sections of tree branch. They are shipped overnight, timed so that it will be just a few days until they start to emerge. From there, they begin to hunt around, listening and feeling for the vibrations that ash borer larva make under the bark of the ash trees. When they find one, they lay their eggs inside the borer, where the eggs grow and eventually kill their host. Kyle Lombard, who heads up the forest health division, peels the bark off of a branch from last year’s wasp shipment. He points out that even though this branch was clearly being eaten alive by ash borer, all of the exit holes are wasp-sized. 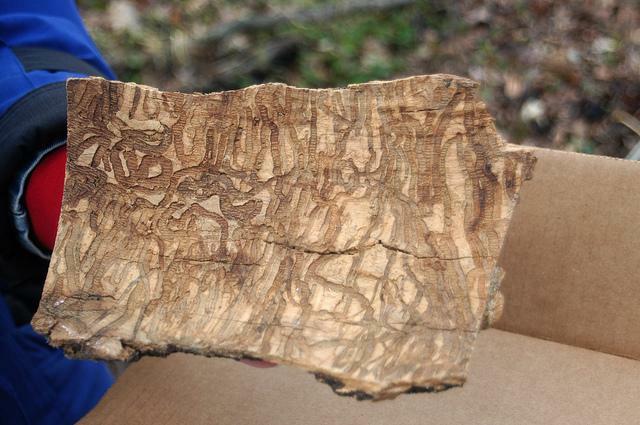 “All of these larvae was parasitized and killed by tetrastichus,” he says, pointing to where the “galleries” carved by the borer abruptly end. 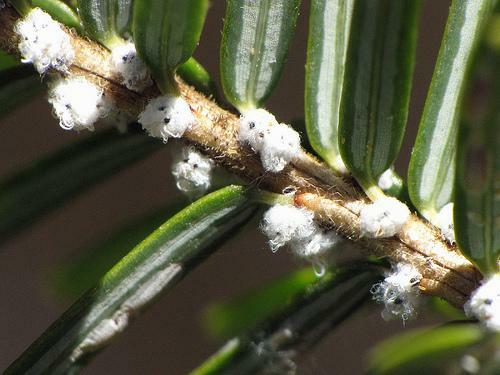 The concept of introducing natural predators is known as bio-control, and many foresters see it as the ultimate solution that will eventually bring this un-checked pest back under control, though it may take decades. In New Hampshire, while native woodpeckers do go after the beetle, by the time a tree is infested, the birds can't keep up. In Asia, there's an entire suite of parasites like these, as well as other predators that keep emerald ash borer in check. But here, all we’ve got is one lab in Brighton, Michigan that’s frantically raising three species of these critters, and shipping them out. “So last year, we produced about 750,000 parasitoids, and we’re targeting a 10% increase on that,” says Ben Slager who runs the lab for APHIS. It costs about $4 per wasp to grow these bugs, but they're provided to the states free of charge. “Of the 25 states that are infested, there are 20 that have requested parasitoids, and so far we’ve been able to supply them sufficiently,” Slager explains. Of course, these states are definitely playing the long-game. They’re waiting for populations of these wasps to establish themselves, and spread outward at a rate of about a kilometer a year. Tetrastichus larvae, in all their glory, ready to emerge as beetle-killing miniature wasps. This isn’t about saving this generation of ash trees, it’s about building up a suite of predators that can be around to save the trees that are just saplings right now. While frigid temperatures don’t feel particularly great, they do play an important role in the state’s ecosystem. One way that cold temperatures can be helpful is by beating back the wave of invasive insects that have laid siege to the state’s forests, but State Entomologist Piera Siegert tells NHPR’s Brady Carlson that the some of the recent headlines about the impact of this cold on invasive bugs over-state the case in the Granite state. A survey is now underway in Concord, to determine how far an infestation of invasive beetles has spread. The Emerald Ash Borer has been detected in trees up and down the Merrimack River in Concord. But so far the survey has not found any of the pests outside of a six-mile radius of the city. New Hampshire has expanded its firewood quarantine to Rockingham County and Hillsborough County east of interstate 293, after discovering an invasive beetle in Salem. 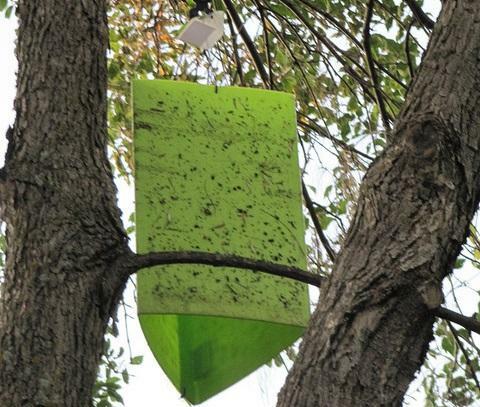 The Emerald Ash Borer – which has decimated ash trees in the mid-west – was discovered in traps mounted less than a mile from an infestation just south of the New Hampshire-Massachusetts border, in North Andover. New Hampshire's forest rangers are cautioning visitors to this weekend's NASCAR race: If you're camping, buy the firewood locally or have a certificate showing it's been heat-treated. They're trying to slow the spread of the emerald ash borer, an invasive species that has destroyed millions of ash trees over the past decade. It's been found in some areas of New Hampshire. Rangers will inspect firewood coming into New Hampshire Motor Speedway from July 9-11. The campground at the speedway is the largest in the state and the race attracts more than 100,000 fans. Merrimack county is under quarantine. Emerald Ash Borer, an invasive Asian beetle that has killed millions of Ash trees in the Midwest, has been discovered in Concord. Once the beetle’s population has been established, they can spread incredibly fast, doubling every year. Today the state learned where the patient zero of the New Hampshire infestation can be found.